Ricoh Imaging has officially announced the Ricoh GR III, the much anticipated enthusiast compact camera with an APS-C sized sensor and high-end features as otherwise found on Pentax DSLRs such as sensor based shake reduction, anti-alias filter simulation, low noise, and high ISO capability. The GR III features a 24 MP sensor and a 18.3mm F2.8 lens (this lens has a field of view corresponding to 28 mm on a full frame camera). In addition to built-in WiFi the camera also sports Bluetooth for more flexibility when connecting the camera to a smart phone. The GR III is also the first camera in the Ricoh/Pentax family to be provided with a touch screen. The GR III has no built-in viewfinder, but two external optical viewfinders which attach to the hot shoe will be available, one of them being very compact. The GR III supports the Pentax P-TTL flash protocol and has no built-in flash. The ISO range tops out at 102400 making indoor photography possible without flash in many cases. A 0.75x wide angle attachment has also been announced. With this attachment the focal length becomes approximately 14 mm (21 mm in full frame equivalent). The launch price in the US is $899.95. The GR III is expected to be presented at the upcoming CP+ exhibition in Tokyo and should be shipping from March 18, 2019. 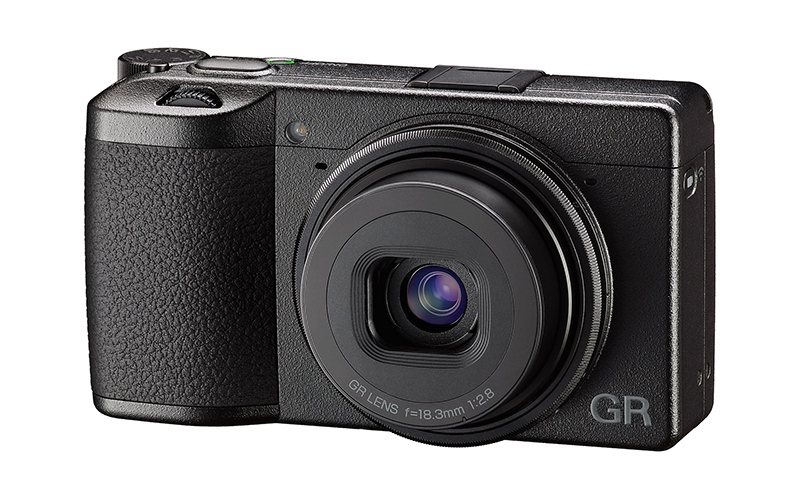 The full specifications of the GR III have been posted in our camera database. You can also learn more from the press release cited below.